Carbon monoxide (CO) is called the invisible killer because you cannot see it or smell it. This poisonous gas is created when fossil fuels, such as kerosene, gasoline, coal, natural gas, propane, methane or wood, do not burn completely. The only way to detect CO is with a working CO alarm. Use the following resources from NFPA and the U.S. Consumer Product Safety Commission to conduct a CO alarm awareness campaign in your community. ATTENTION CANADA - Get Carbon Monoxide resources specifically for you. Whether you’re talking to residents or the media, here are some talking points to help you stay on point. Spread the word on carbon monoxide safety through a variety of approaches. Statistics and information about this important topic. In a brief presentation, hook your audience, help them learn new information, and wrap up in a concise manner. NFPA’s Ben Evarts discusses key points from NFPA’s “Non-Fire Carbon Monoxide Incidents” report and explains why CO is dangerous. 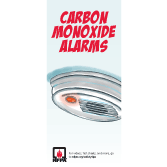 Carbon monoxide (CO) dangers come across loud and clear in NFPA®'s new public safety brochures.